Lock in a great price for Oryx Rotana – rated 8.9 by recent guests! Food was amazing. 24 hour room full room service menu. OVERALL the hotel is one of the best you can get in Doha. In terms of house keeping and service it rates well. The facility is good and comfortable and I would give 5 stars to the house keeping and spa staff. However despite being 5 stars I would like to make comment about the reception staff who failed to record the Qatar Airway miles despite numerous requests and confirmation that it was done. In terms of restaurants the buffet is great and good value. The Cellar / Spanish restaurant is great food however staff could use more training so they get up to standard with the offering. The really disappointing part was the stall At Al Nafoura who lack any knowledge of 5 star or proper international manners. Overall we stayed for 1 month at the hotel and would definitely go back but good criticism is important an I hope management take training into consideration. The staff was very friendly, especially our host at breakfast, Mr. Ashraf and our room maid, Arzu. They made our stay there more comfortable and special! Rooms are quite large. Almost at a size of suit compared to hotels in other side of the world. Options for a good breakfast is quite a lot. The response from dining two late and even when requested to fill mine bar refused. Oryx Rotana This rating is a reflection of how the property compares to the industry standard when it comes to price, facilities and services available. It's based on a self-evaluation by the property. Use this rating to help choose your stay! Located close to Hamad International Airport and 10 minutes away from Souq Waqif, Oryx Rotana features an outdoor pool and a spa offering massage treatments. Refined cuisine and live jazz music can be enjoyed at the club. The soundproofed 400 deluxe rooms have a seating area and flat-screen TVs with satellite channels. They include large bathrooms with walk-in rain showers, bathrobes, and hairdryer. The property offers an executive lounge and distinctive outlets which are favorite hot spots in Doha; dining at Choices is a culinary delight of the highest standards. The open kitchen serves up a superb buffet breakfast, lunch, and dinner in addition to an à la carte menu and daily Theme Nights. The exclusive Jazz Club with live band entertainment six nights a week from Sunday to Friday, The Cellar offering specialty wines and Mediterranean Tapas and the Al Nafourah Garden with a delicious Arabic menu, al fresco dining and hubbly bubbly. The Sky Lounge is the all-day venue for meeting and chatting over a cup of coffee and a pastry under the stunning high glass conservatory-style ceiling. 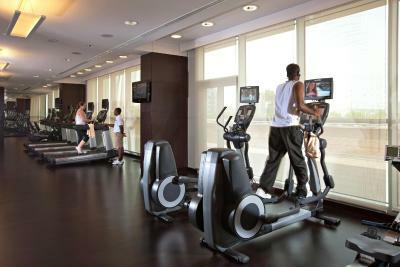 To keep fit, The Bodylines leisure and fitness club at the hotel offers a fully equipped fitness center. Doha’s landmarks, including the Museum of Islamic Art, are located on the waterfront Corniche, a 5-minute drive away. Oryx Rotana provides an airport shuttle and limousine services for an extra charge. Free private parking is available on site. 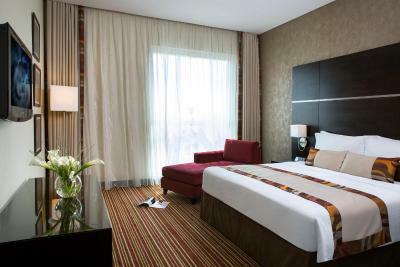 When would you like to stay at Oryx Rotana? Air-conditioned room featuring flat-screen cable TV, a mini-bar, and a safety deposit box. It also offers tea/coffee making facilities, ironing board and working desk. The bathroom includes a rain shower. Complimentary bottled water is also provided. This spacious, air-conditioned suite features a separate living and dining area. It has a double room, a flat-screen TV, tea/coffee making facilities and a small fridge. Complimentary bottled water is also provided. Our Oryx suites are 110 sqm with separated living/dining area and king size bed. 49 inch LCD TV, IP phone, working desk, free internet. kitchenette, complimentary coffee, and tea making facilities, fridge, iron and iron board, city/airport view with an access to Club Rotana Lounge. This double room features a soundproofing, air conditioning and mini-bar. Club Rotana King Rooms feature amenities including state-of-the-art 43 inch LCD TV, a full mini-bar, bedside guest digital assistants, tea and coffee making facilities, free internet, iron board, IP phones with working desk. These luxurious 35 sqm rooms feature 43 inch LCD TV, a full mini-bar, bedside guest digital assistants, tea and coffee making facilities, free internet, iron board, IP phones with working desk. The moment guests step into the Oryx Rotana, they will be enchanted by its unique blend of traditional Arabian hospitality and the breathtaking opulence of modern and contemporary luxury. The iconic architectural design of the hotel has turned Oryx Rotana into Doha’s premier meeting place, ideal for both business and leisure. House Rules Oryx Rotana takes special requests – add in the next step! Oryx Rotana accepts these cards and reserves the right to temporarily hold an amount prior to arrival. Great variety at the buffet. No organized boarding of the airport shuttle and the man managing the boarding was disorganized and asked my husband who had already boarded to get off the bus so we could ride together. There was no first come first serve and no official line. Everyone just rushed on to the bus without worry that there were people waiting longer than them. Lots of pushing and shoving to get on. Bus too small to support morning crowd. We had to wait along time to check in and check out. There were 4 computers at the desk but only 2 members of staff dealing with customers. Brunch and breakfast were beautiful at choices restaurant. The room is nice but the decor could feel a bit more happy. The combined orange and brown theme is not really inspiring and lets an otherwise super hotel down a bit. In room furniture, particularly the sofa could be better given its 5 star calling the rooms need an upgrade. Bathroom is excellent. Great staff, great buffet, Just all round great. A nice selection of outlets, coffee shop, jazz club, wine bar and Chinese restaurant. The atrium view is spectacular and it's worth staying just for this. Unfortunately, for healthy reason, I had to short my stay in hotel after the first night. And even if the rate was per night, staff did not reduce the total amount debited in my credit card (4 nights). The hotel told that it is Booking.com had tooken the payment (which is not true) and said they can not do anything because it is a price for a package (not true also, the price was per night). I think the hotel would been able to do something (even minimum as a commercial manner) taking in consideration the reason of my early check out and the fact that I stay in this hotel usually 2 weeks per month from last February and till April. As usual, this hotel is cleaned, modern and very well placed.